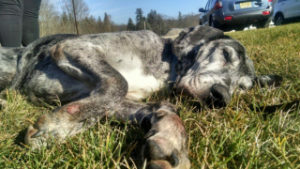 Q: What is the Mid-Atlantic Great Dane Rescue League and what do you do? 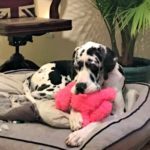 A: The Mid-Atlantic Great Dane Rescue is committed to helping abandoned, neglected and/or abused Danes find suitable homes. With over 350 volunteers, we spay/neuter, provide necessary medical treatment and train/socialize the Danes in our care to ensure adaptability in their new homes. We work hard to also educate the public and potential owners about caring for this wonderful breed through various community efforts. Q: Where do you get your Danes? A: Most of the Danes that come into rescue are surrendered by their previous owners for a variety of reasons. We also work closely with local shelters and SPCA’s to place unwanted Danes. Q: Why are Great Danes turned into rescue? A: One of the most common reasons for surrendering a Dane is its size. Owners often claim that they didn’t realize how big the puppy would get when full-grown. For this reason, we rarely receive puppies in rescue. Another reason can be that other members of the family are opposed to keeping the Dane or there are extenuating circumstances, such as, divorce or financial difficulties. Sometimes, if the owner didn’t take the time to properly train the dog in basic obedience, they state that the Dane is destructive or uncontrollable. At any given time, we have between 70-90 Danes available. Q: Where are the dogs kept while they wait to be adopted? A: Before MAGDRL takes a Dane into rescue, we send a volunteer to evaluate the dog in its current residence or at the shelter to determine their temperament. We do our best to obtain copies of vet records from previous owners as well. MAGDRL has a network of volunteers who provide foster homes for our rescued Danes. Foster homes are responsible for caring for, socializing, and teaching the Dane basic house manners and obedience commands. However, we have a limited amount of foster homes available and are forced to kennel some Danes. Last year, we accrued $19,078.08 for kenneling expenses due to a lack of available foster homes. Q: Why would someone want to own a Great Dane as opposed to another breed? A: Their size and personality is what appeals to Dane owners the most. These gentle giants are loving members of the family whose devotion to their owners is unsurpassed by any other breed. They are literally an owner’s shadow. Q: What is the procedure of adopting a Great Dane from MAGDRL? A: First, we urge you to research the breed. Once you’ve decided that a Dane will fit your lifestyle, you can contact your local coordinator to start the adoption process. Please note that we require a fenced yard (electronic fencing is not acceptable). You can refer to the fencing policy if you are unable to fence due to extenuating circumstances. A volunteer will conduct a phone interview to assess your expectations about living with a Dane, and to explore what type of Dane would suit your lifestyle the best. Next, we will conduct a vet check to verify that your current and previous animals are UTD on shots and spayed/neutered. Finally, a volunteer will conduct a home check by bringing a resident Dane (not a foster) to your home to provide you with the opportunity to experience what it’s like to have a Dane in your home and to assess the current pet’s reactions to the newcomer. 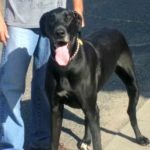 Provided all goes well, your local coordinator will then help match you with a Dane that is appropriate for your family and lifestyle. You can view current foster Danes available for adoption on www.magdrl.org and read their bios. 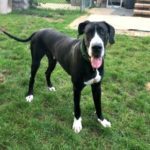 Approved adopters can adopt a Dane that is out of state, provided that all members of the family are willing to travel to the foster home to initially meet the Dane before adopting. We also encourage new adopters to join our yahoo group because we have a network of volunteers who can provide information for any questions or concerns the new adopters may have. Q: What are ways I can help MAGDRL? A: There are many ways to help the rescue. We accept donations and sponsorships for our Danes in addition to hosting numerous fundraisers to help cover the cost of medical expenses. We are always in need of volunteers to help with a variety of tasks and foster homes for our Danes. 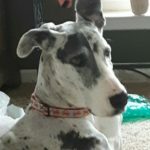 Please check www.magdrl.org to find out more ways you can help the Mid-Atlantic Great Dane Rescue League.